It’s a great way for a Boy Scout to explore the underwater world and enter into a lifetime of fun and adventure. 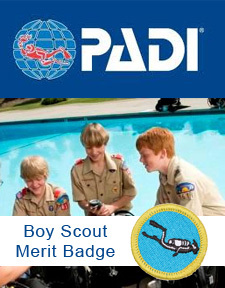 Boy Scouts of America and The Professional Association of Diving Instructors (PADI) have teamed up to offer a Scuba Diving Merit Badge. Scout receives the Merit Badge for successfully completing the PADI Open Water Diver Certification and the Merit Badge workbook. Our instructors are merit badge counselors and ready to assist your Boy Scout in achieving the Scuba Diving Merit Badge. Individual Scouts may enroll in one of our regularly scheduled courses, or we can put together for a group of Scouts. Contact Carolyn at Adventure Scuba to start your scuba adventure!